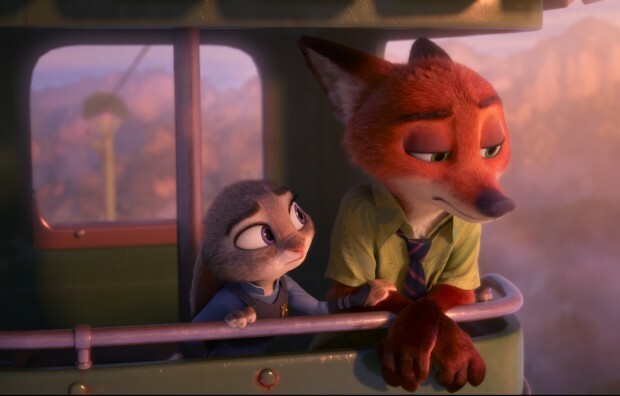 A rookie bunny cop and a fugitive fox star in a scene from the animated movie "Zootopia." NEW YORK (CNS) — Anthropomorphism runs amok in the 3-D animated comedy-adventure “Zootopia” (Disney). As with Disney’s “Cars” franchise, which presented a world of automobiles with human traits, “Zootopia” personifies all creatures great and small. They jabber away among themselves as each earns a living in the bustling metropolis of the title. Inside jokes and clever puns abound. City dwellers shop at Targoat, sip lattes from Snarlbucks, call up a ride from Zuber — and make deposits at the Lemming Brothers Bank. At the DMV, short for the Department of Mammal Vehicles, the lines are long and all of the employees are three-toed sloths who, true to their name, move at a glacial pace. The newest arrival in this urban setting, where predators and prey live in apparent harmony, is Judy Hopps (voice of Ginnifer Goodwin). A bright-eyed and bushy-tailed rabbit from the suburbs, Judy is eager to fulfill her lifelong dream by becoming the first bunny officer of the Zootopia Police Department. Through grit and perseverance, she succeeds, only to face resentment and prejudice from her peers as well as her boss, the imposing buffalo Chief Bogo (voice of Idris Elba). He assigns Judy to parking duty, while much larger cops (including an elephant and a rhino) take on important criminal cases. Determined to make the best of it, Judy hops into action. As she racks up the tickets, she encounters wily fox Nick Wilde (voiced by Jason Bateman), a small-time con artist. It turns out that Nick is a key witness in a missing “person” case that Judy wants to solve to win the respect of her co-workers. As natural enemies become collaborators and, ultimately, friends, “Zootopia” morphs into a buddy movie. Directors Byron Howard (“Tangled”) and Rich Moore (“Wreck-It Ralph”), together with co-director Jared Bush, keep the action moving at a fast pace. Unfortunately, the film takes a dark turn as the investigation proceeds, exposing the seedier side of Zootopia. Scenes of animal conflict and cruelty could frighten and confuse the younger set. And that’s not to mention the somewhat paradoxical naturist club where animals shed their clothes. Parents will smile at references to classic films that will fly over their children’s heads. Particularly amusing is Mr. Big (voice of Maurice LaMarche), a tiny arctic shrew who’s a dead ringer for Don Corleone in “The Godfather.” As the mobster threatens our furry duo, the wedding reception scene plays out in the background, and before long Mr. Big is dancing with the bride. The film contains occasional mild action violence, including torture, bullying, a naturist theme, some rude gags and momentary religious but not irreverent humor. The Catholic News Service classification is A-II — adults and adolescents. The Motion Picture Association of America rating is PG — parental guidance suggested. Some material may not be suitable for children.